Удобно разположен в Сием Реап, Mantra Angkor Boutique Villa е чудесна стартова точка, от която можете да започнете да проучвате този оживен град. Центърът на града е на около 2.8 km, а до летището може да се стигне до 18 минути. С удобното си местоположение хотелът предлага лесен достъп до всички градски забележителности, които задължително трябва да се видят. Съоръженията и услугите предлагани в Mantra Angkor Boutique Villa гарантират Вашия приятен престой. Този хотел предлага множество удобства, за да задоволи и най-изискания вкус. Хотелът се характеризира с 20 стилно обзаведени стаи за гости, в някои от които ще намерите безжичен интернет достъп (безплатен), стаи за непушачи, климатик, отопление, събуждане. Хотелът разполага с голямо разнообразие от развлекателни съоръжения като масаж, билярд, градина. Mantra Angkor Boutique Villa е най-подходящото място за Вас, ако търсите качествен хотел в Сием Реап. Понравился отель и расположением и отношением персонала! За сущие копейки я проживал в 206 номере-был кондиционер, телефон, горячая вода. Пребывание прошло нормально. Отель хорошо расположен (не далеко к анкору) но на самом деле это не важно так как у тук-туков фиксированая цена по достопримечательностями где вы живете не важно. Есть хороший интернет и достаточно хороший персонал. Но есть много "но" начнем с того, что постельное белье и полотенца в ужасном состоянии (грязные и такое ощущение, что им лет 10), так же проблема с горячей водой, водонагреватель есть, но горячую воду мне так и не удалось получить. Завтраки полный провал (омлет из, внимание одного яйца, два кусочка хлеба и чуть-чуть масла (даже на один кусок хлеба не хватает). Сам номер супер мрачный, старый ремонт, мебель, нет сейфа и тд, еще убивал белый свет (энергосберегающие лампы). Но возможно это и нормально за 10$ в сутки, хотя я видел хорошие отели чуть дороже. Karuna and his team had been very accomodating even before our arrival. Our inquiries were always responded to, and upon arrival, tuktuks fetched us from the bus station (for free!). Bottled water is also provided (unlimited) and our requests were all made possible (early breakfast, Angkor National Museum tour, assistance for transfer to Bangkok, etc). The staff were very friendly and accomodating, our Cambodia trip was so wonderful because of Mantra Angkor Botique Villa's service. Took a quick trip to Cambo with my best friend, and this place was perfect for our trip. The room had AC and a fan as well, along with hot water and two clean beds. We had a breakfast included with the room, which was a nice start to the day, and the staff did a great job helping us arrange tuk-tuks to Angor and into town. They were so friendly and helpful the entire time, and made sure we were taken care of. I will definitely stay there again if/when we visit Cambodia again. this place costs roughly half of the better equivalent places due to its location a couple of kilometers away from pub street and old market. it is however closer to the temples, to the temple ticket office, a couple of khmer rouge historical sites and an upscale condominium complex with good restaurants at fair prices. i hate to give it less than five stars on all criteria, as that is sometimes viewed as a failure due to overgenerous reviewers who call average exceptional. i am a retired travel agency owner who travels with my young family. 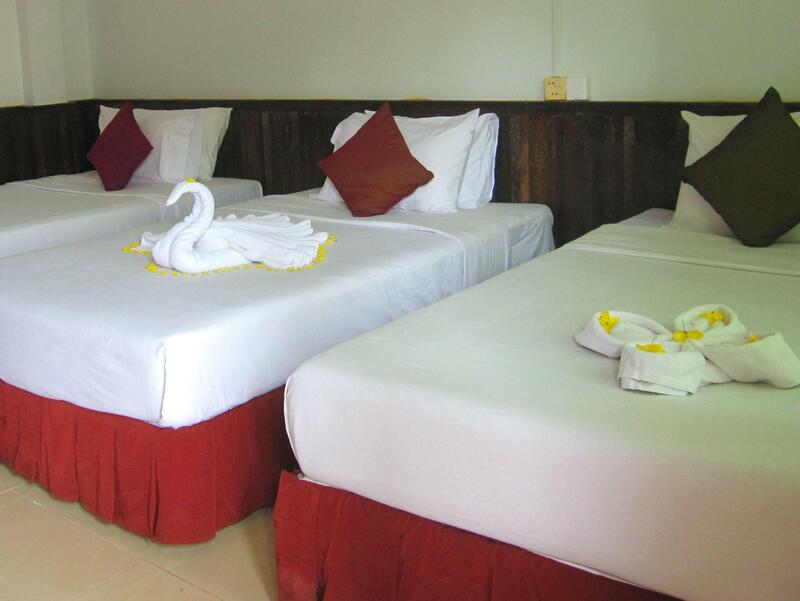 The hostel is located perfect for People who want to go to the temples of Angkor. The staff is really nice and helps with all your questions and problems. Our bed was not really comfortable but we talked to others and they said there bed is comfortable. So maybe we had just bad luck with our room. The bathroom is ok. Free wifi which works really good. Close to the hostel there is a small supermarket and nice restaurants! This hotel was super - right in the heart of where you want to and need to be for Angor Wat, so safe and lovely, but at 10% of the cost. There were things here and there that were falling apart for the hotel - the fridge was smelly and moldy, the door handles were falling off, but the tuk tuk driver on staff was a gentleman and fair, the location was amazing, the staff was so helpful, wonderful, professional, hard working, etc., and the food at their new little restaurant was WORLD CLASS! It was terrific for a convenient restaurant at our location - great to relax after a long tour day at the ruins, so we were so lucky on that part. We will stay here again! We loved the hotel and young helpful staff who struggled with English and our requests to do everything and see everything from a more active sports perspective versus the older sitting crowd. The rooms were ok with door knobs falling off and ill functioning refrigerators and the pool is at another hotel, but tuktuk driver was so amazing honest and kind, and staff for dinner was so outstanding with delicious local food. Yum and great value and outstanding location despite the hotel and room quirks. We came originally for 3 nights, but stayed a week and truly loved our experience at this property. I think for the money we paid we had a great stay. Our room was spacious and clean, the only downside it was facing a road and was pretty noisy starting at 5 am. Everyone from a staff was attentive, caring and responsive. When we left I forgot my purse in the room and the owner found us later during the day returning my purse and everything in it. The food we ate was good, people were friendly and overall we had a good stay. The best about Mantra for us was the great staff who was so accommodating and friendly! We really felt that they were interested to make everything comfortable and to help with everything. Not all members speak english very well but in case they don't understand you they will ask for a member who will understand, ask again to get it right etc. The room price was absolutely fine (AC, fridge, cupboard, big bathroom) and the restaurant and bar offered asian and western food or cocktails to a fair price. Breakfast (ham or egg with bread or a noodle soup, tea or coffee) was included. Its located a little bit off the city, so its actually calm at night. Its also closer to the national park, they rent bikes at the hotel and you can cycle to the angkor wat if you like. We really enjoyed the stay, thank you very much! We would visit again! I just back from Siem Reap. 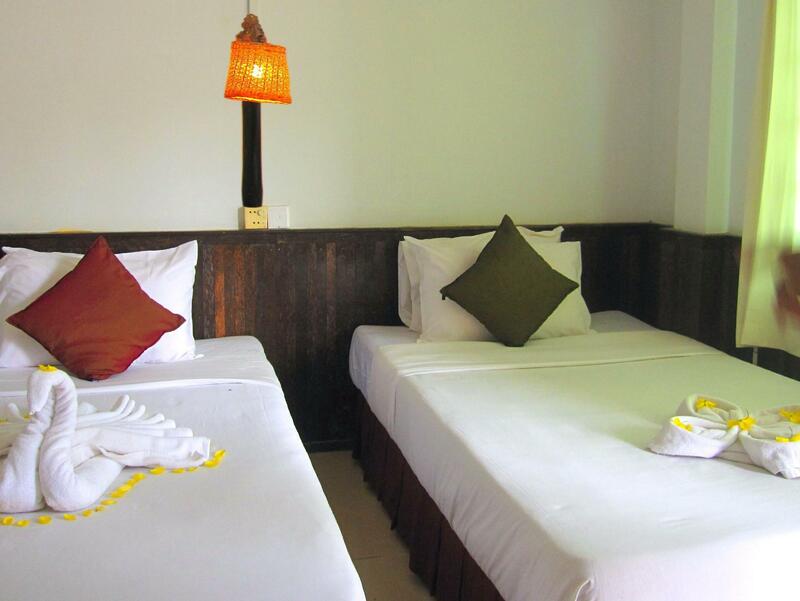 I love the location, its in middle between Angkor Wat (3km) and Pub Street (3km). U can go by Bicycle or even walk if you're active person and don't mind to walk 3km. If you like Enjoy recommend to stay near Pub Street. But I choose this place because i like relax, Calm and silent place. And of course it near to Angkor Wat and even u can go pub street. 3km from there. Yes its Value for Money, I get this room US$7 Per night. Including Breakfast. If you're 2 person, it's very cheap US$3.50 per person + including Free breakfast. And Wifi also super Good. Cleanliness: Its just average but I think its ok because it also cheap. Everything is ok, they got tv, freezer, Fan, Aircond, Toilets, Soap, brush etc what u need everything they provide it. Staff: Very helpful, I like All staff. They are so friendly. including the Guesshouse manager Mr. karuna. he help me a lot. Facilitties: Everything is got. If u need tuk tuk, bicycle, just inform them. they will arrange for u. But if u need the foods u have to go Pub Street. Somehow its not so far. Only 3km from there. Great VFM. Included bottled water, which was great given it was so hot. Would definitely recommend to co-travellers. Staff were great, arranged for tuk-tuks and explained to the driver where we wanted to go. Recommended places to eat, and were very helpful. Washed our clothes through the hotel for $1.50 per kg. The rooms are clean and comfortable. The staff and very helpful. The place is situated in a very amazing area. Near to everything. I arrived on my own, as my husband had to be elsewhere. The staff were excellent, the room beautiful and comfortable. They saw to all my needs. The tuktuk collected me at the hotel on time, and the driver were cautious and great......A beautiful hide away, on route, friendly and clean. I would stay there again if I ever go back there. Definately worth it. Отседнахме 5 вечер/и в юли 2015 г. Stayed for 4 nights and had a good time. The owner, DJ, is helpful, friendly and lovely to talk to. Vuth was my tuk tuk driver and he was good too. Chose Mantra for its close location to Angkor Wat. Renting a bike for just $2 a day and cycling to Angkor Wat and Pre Rup on the first day was amazing. Taking a tuk tuk or bike from the hotel is never a problem. We stayed there for 2 nights and everything was nicely arranged. We even arranged the trip to Angkor Wat with the tuk tuk that the hotel provide to pick us up from the bus stop in Siem Reap, worth the money since lots of tuk tuk inside the Angkor Heritage area charge more expensive price and the tuk tuk is equipped with lots of bottled water and wet tissues which are really useful under the very hot sun and dusty weather. The room was spacey so does the bathroom, although the sheets could be better (and cleaner) since we spot quite a few stains, but it was okay. Overall the location is good, it's near from restaurants and Angkor area, and also the bus station, if you happen to travel to Siem Reap by bus. The hotel is located a little out of the city center, but you can get there by tuk-tuk for fairly low price. The staff is superb. Ladies were very kind and helpful. There wasn't any problem during our stay, and they handled our requests with smile. Room and bathroom were clean but a little bit small. You can use cute little patio and pool table to chill. I would recommend this hotel to everyone. The most accommodating staff I've ever met! 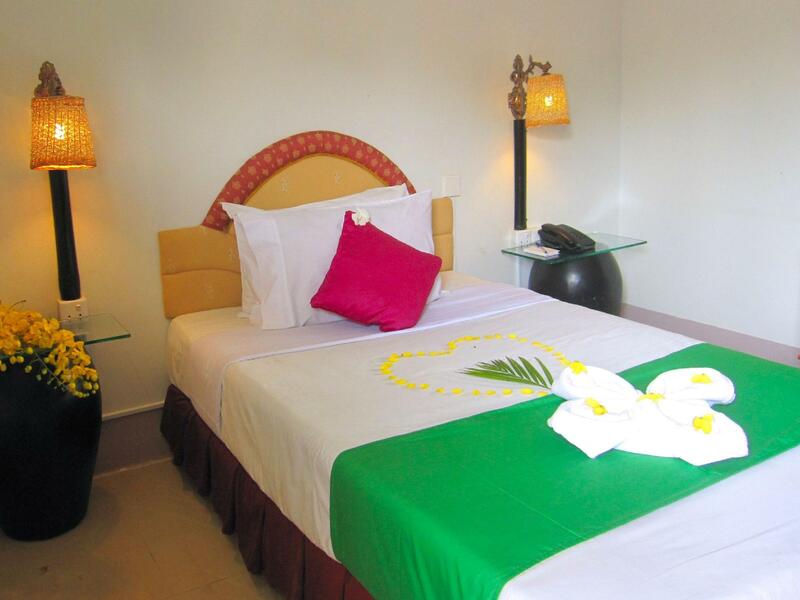 The place is also near the Angkor National Museum, but not walking distance to it.